Banana Bread is one of my favorite snacks that I make often. In my home, nothing goes to waste and all my soft, mushy bananas all go in making banana bread. The key to a good banana bread is using the softest banana you can get your hands on. It is very sweet which requires less sugar than normal, and it helps in achieving a moist texture. 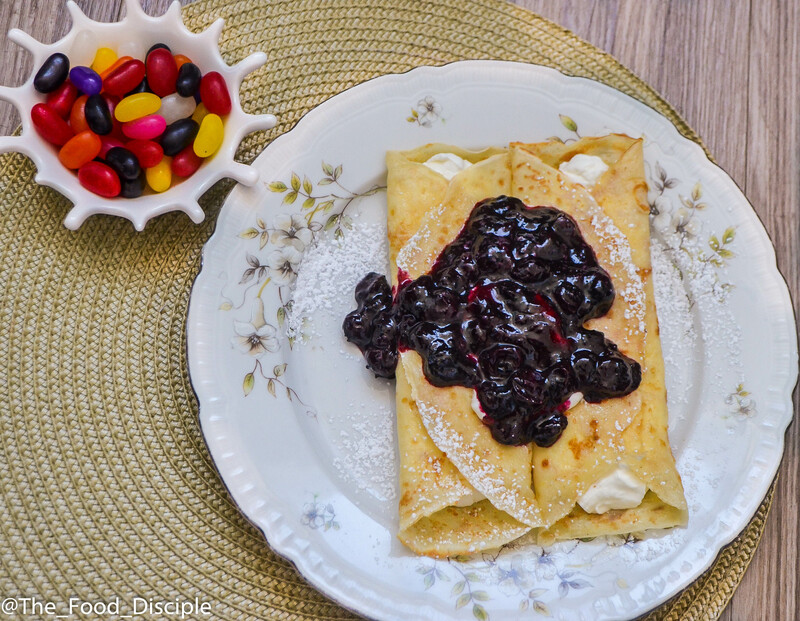 This recipe is perfect as an appetizer,dessert (top with ice cream), for breakfast or brunch served with hot Coco or can be enjoyed as a treat for you, your family and friends. 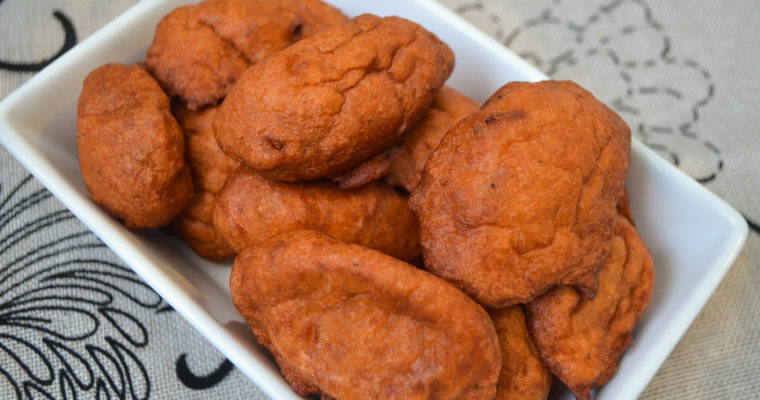 One thing I really enjoy about this recipe is that it is sweet, moist and very very fluffy on the inside; to me ladies and gentlemen, that is the perfect combination😋. 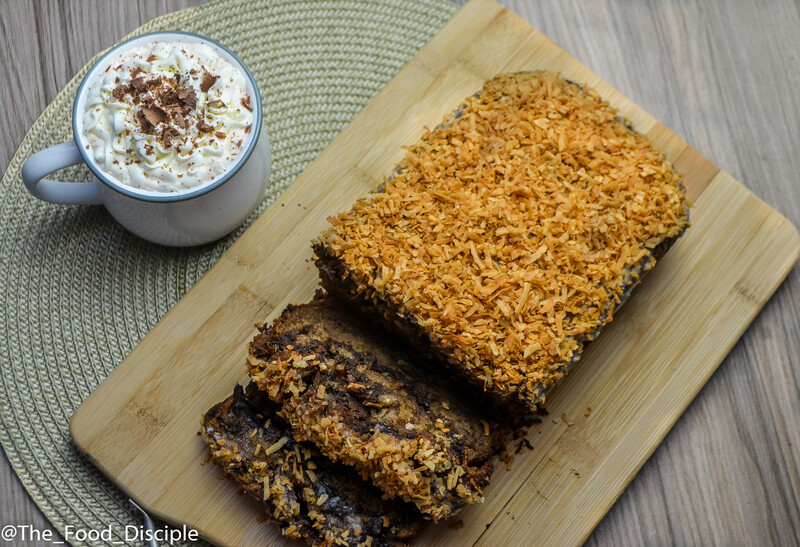 I decided to try something different with this recipe and I topped it with some toasted shredded coconut mmmhhmm I love coconut. 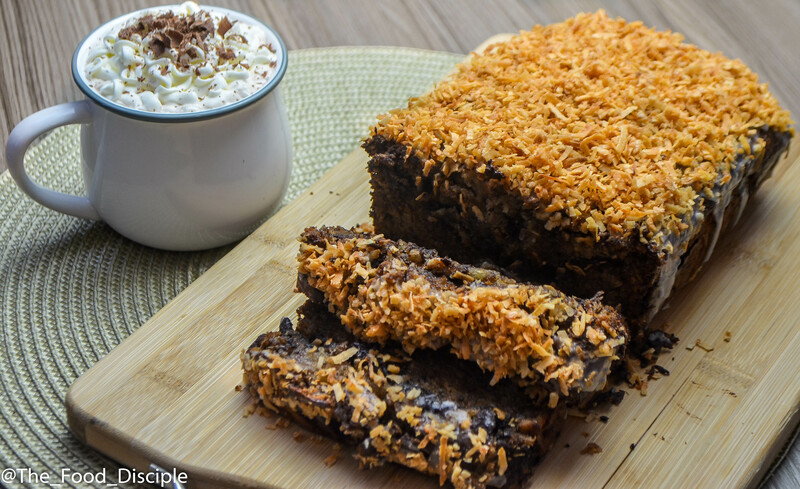 Topping my bread with shredded coconut gave me that crunch that I love and get when I make my Southern Buttermilk Biscuits, giving it a little edge and taking my banana bread to another level. In order to make sure my topping sticks on the bread, I added coconut glaze to the bread which served as a binding agent for the shredded coconut to stick on the bread. Oh My God! 🙆turned out way better than I expected. 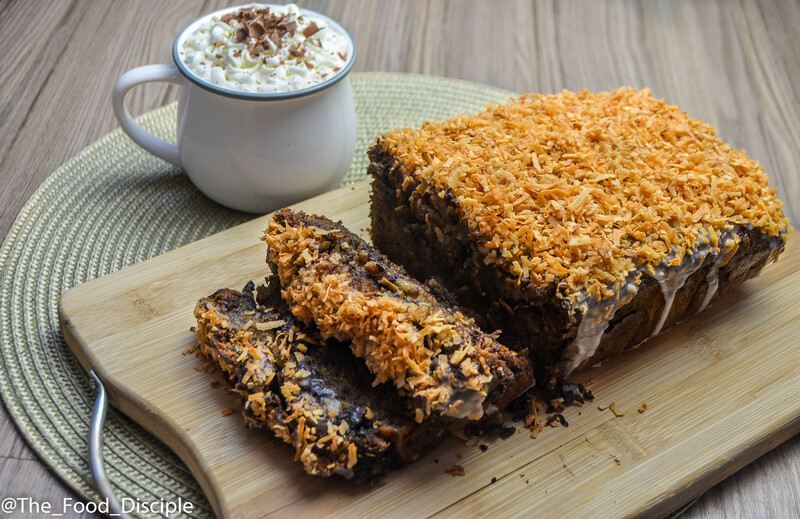 The glaze adds another layer to the flavor and sweetness of the banana bread and the crunch and flavor from the coconut brings it in full circle😋😍. 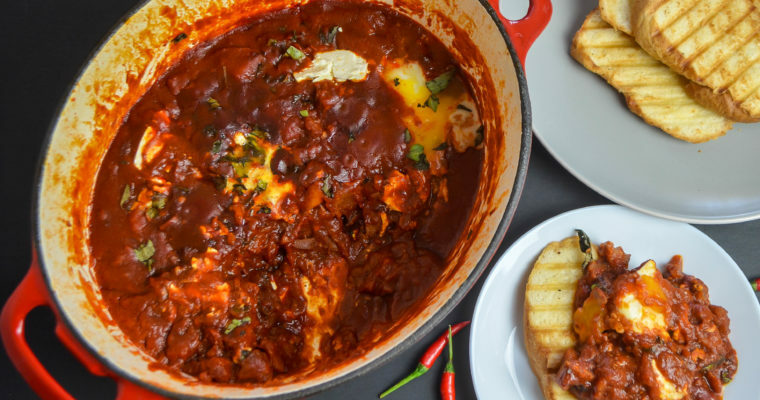 This recipe is one for the books and I just had to share this recipe with you all. Trust me you do not want to miss out on this amazing treat! I will love to hear your feedback. Step 1 Preheat oven to 350 degree F. Butter your loaf pan and line with parchment paper. Let your parchment paper hang over both sides. Step 2 In a bowl mix your flour, baking powder and soda. Set aside. Step 3 In a different bowl, mash your bananas until smooth, add your milk and lemon juice. Properly mix and set aside. Step 4 Lastly in another bowl, combine your butter and sugar and whisk. Add your egg and vanilla extract. Whisk until smooth. Step 5 Gently and slowly add your dry ingredients and banana mixture alternatively. Properly mix together. Add half of your mixture in your loaf pan, and then add your melted chocolate. Using a toothpick gently make a swirl on your banana bread by dragging the toothpick around your bread, incorporating both your bread and chocolate together. Now add the other half of your banana bread. Step 6 Bake for an hour or more if needed. Your bread is ready when you insert a toothpick in the center and it comes out clean. Step 7 Let your bread cool for 30 minutes in pan. Now take it out of the pan and place on a board or plate and let it completely cool. Step 8 To make your glaze, combine your coconut oil, milk, vanilla and coconut extract. Properly mix using a whisk until they are combined. Now add your confectioners sugar and mix until completely incorporated. If glaze is too thick loosen with very little milk, about a tbsp. Toast shredded coconut in a hot pan until browned. 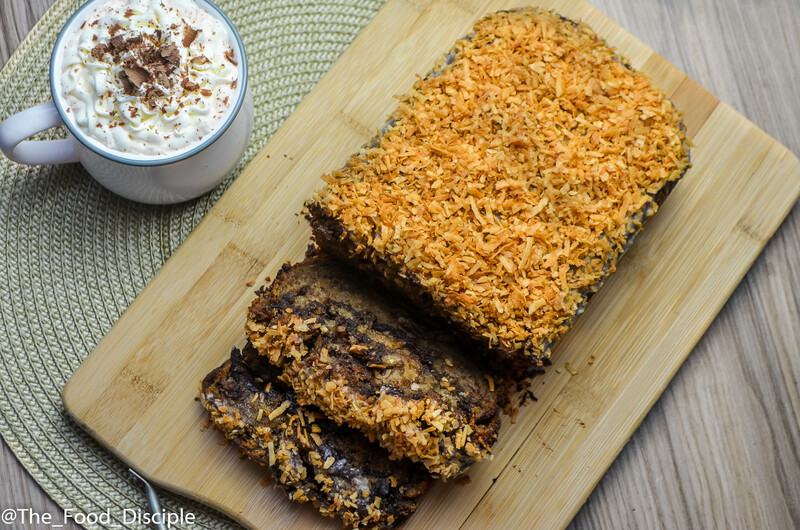 Step 9 Drizzle glaze on cooled banana bread and topped with toasted shredded coconut. Step 1 To make crepes, properly mix all ingredients in a bowl. Cover and place batter in the refrigerator for at least an hour. This will help the bubbles in the batter decrease to avoid tearing when cooking. 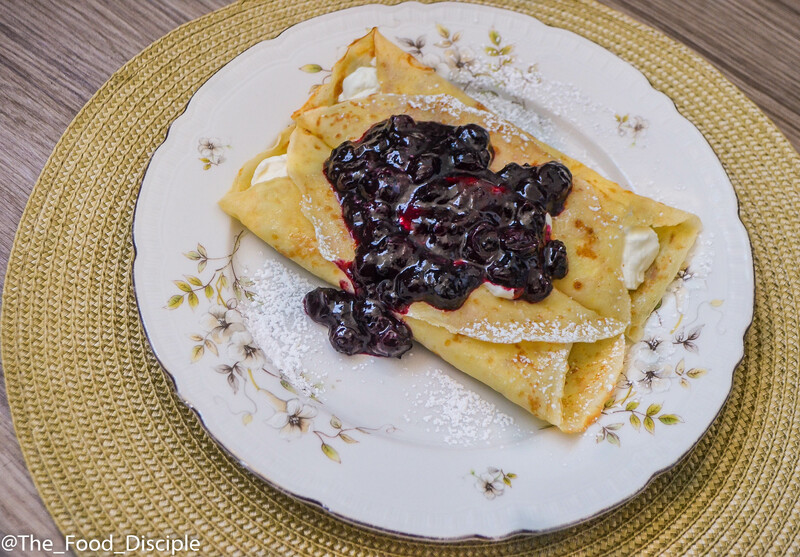 Step 2 Heat non stick pan and coat properly with butter.Using ¼ cup of batter per crepe, pour into the center of the pan and tilt in a circular motion to spread batter evenly in the pan. Cook for 30 seconds and flip to the other side and cook for an additional 30 seconds or until it turns light brown. Place on a flat surface and cover to keep warm. Step 3 To make Blueberry Compote, add jelly beans into water and let it sit overnight or at least 6 hours. Step 4 Place infused water into saucepan and set on medium low heat. Whisk in lemon juice and corn flour until properly incorporated. Add 1 cup of blueberry into sauce pan and let it cook for 10-15 minutes or until sauce has thickened and blueberry skin has fallen off. Add remaining blueberries and add cook for an additional 6-8 minutes. Stir occasionally and do not let the second blueberries breakdown as the first batch. 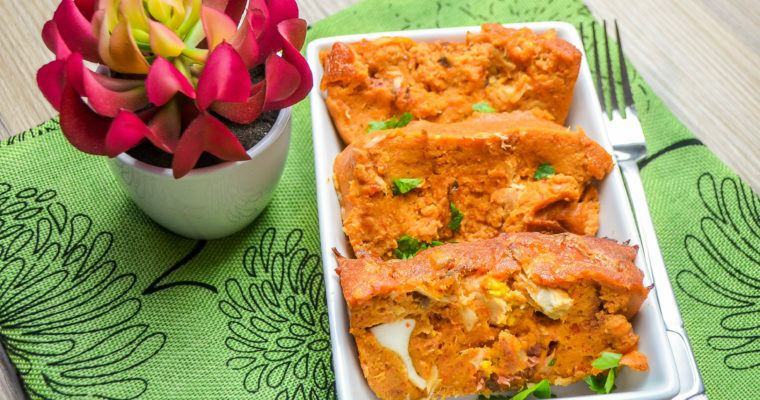 Allow to cool down and refrigerate until ready to serve. 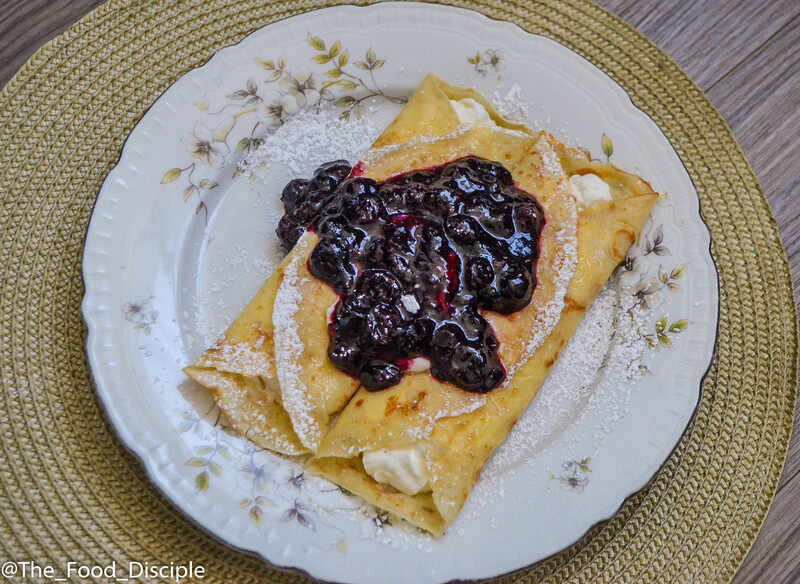 Step 5 Stuff Crepes with whipped cream and top with blueberry compote and dust with confectioners sugar. 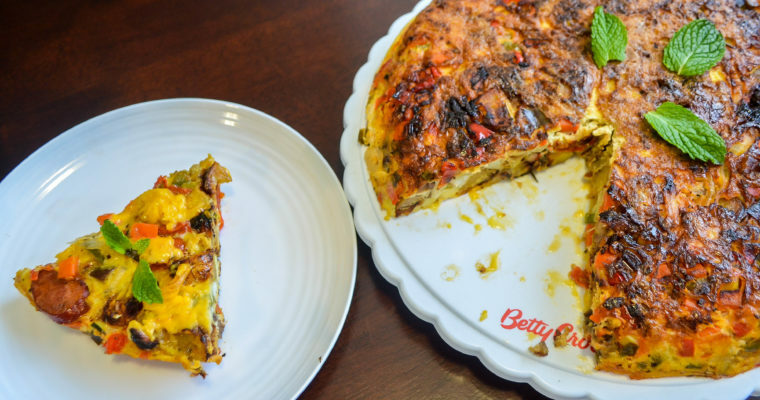 Serve warm for breakfast or brunch and cold for dessert. PS: I recommend making the compote the night before to speed things up. Hope you are having a good week! 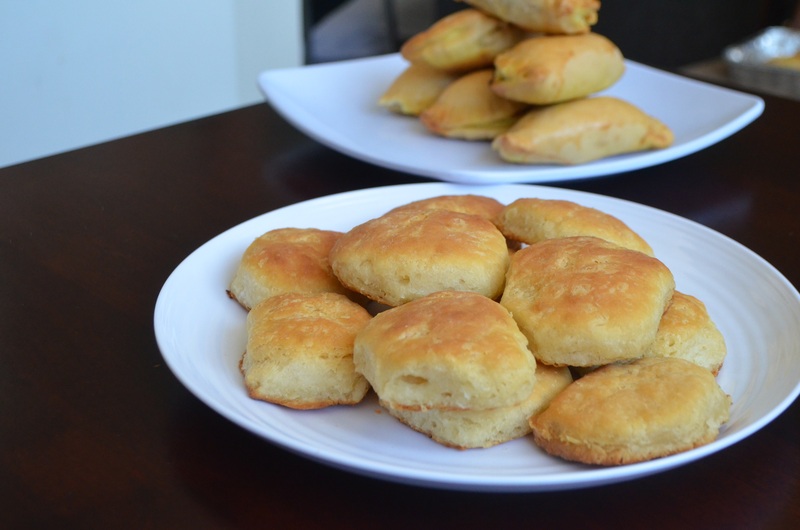 I am back again with another quick recipe. 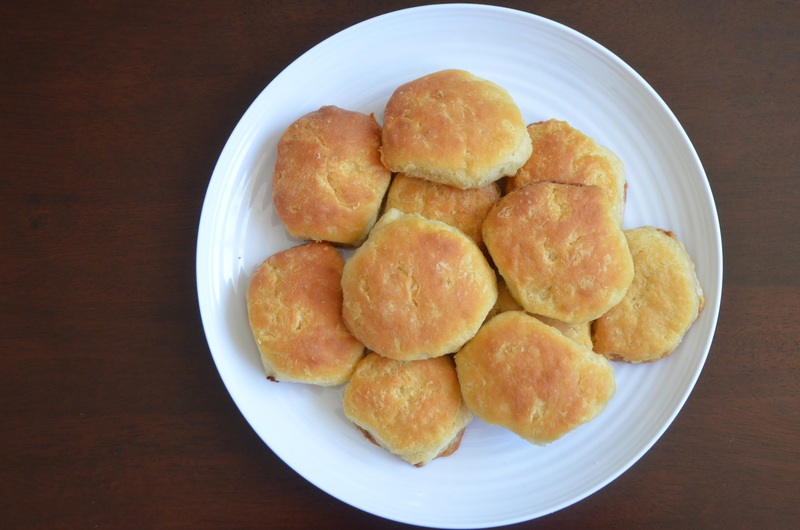 Today’s recipe is a classic southern buttermilk biscuit. For those of you who read my posts, you know my expressed love for Popeyes, I am in love with their meals and more importantly their biscuits they include on the side with every meal 😋 love in plate I tell ya. I was inspired to learn how to achieve this so I can make it anytime I want and enjoy with my friends and family at home. So guys after countless researches, trials and errors, I have found this method to be perfect for me and it works every time. Its close enough to Popeyes, hell! 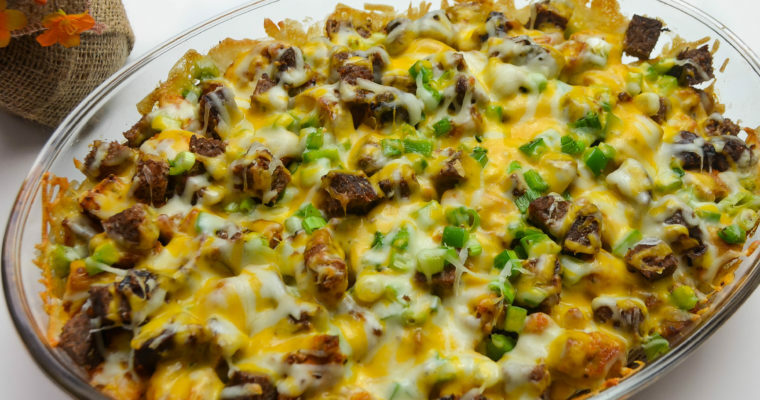 in my opinion is just as good but it is left for you to decide by trying this recipe, and tell me what you think. 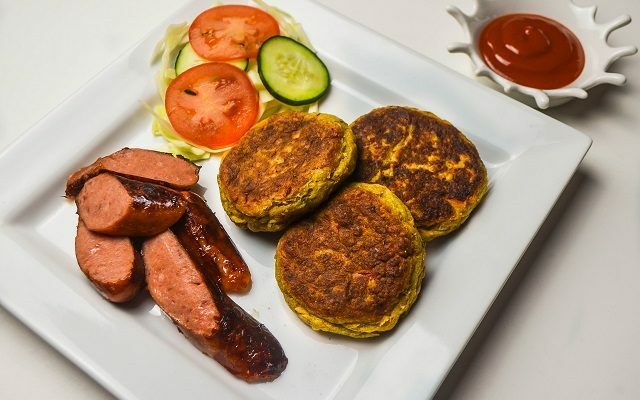 It is very easy and affordable to prepare, you can have it as a side to your meals or you can turn this into a quick breakfast sandwich by adding eggs, cheese and maybe bacon or sausages; whatever you decide just have fun with it. 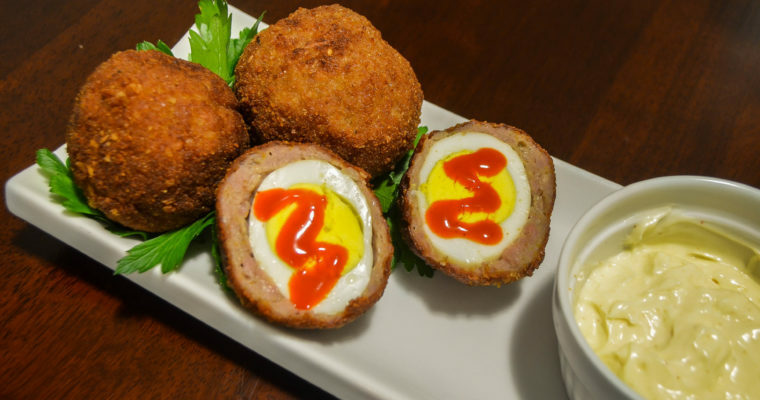 Hey Zinny Factor here is another quick recipe you can share with your readers. Step 1 In a bowl, add your white lily flour and set aside. If you are using all purpose flour, mix with baking powder and set aside. 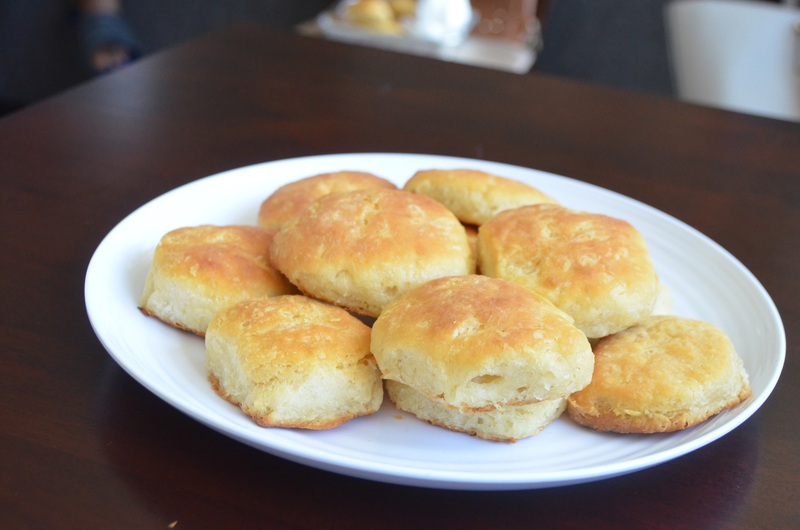 White lily flour is ideal because it has less protein and gluten which makes the biscuit very tender and fluffy in the end.I recommend adding salt if you want your biscuit to taste just like Popeye’s. Step 2 Grate your frozen butter stick and combine with flour and toss together using your fingers. Place in the refrigerator for 20 mins or freezer for 10 mins. 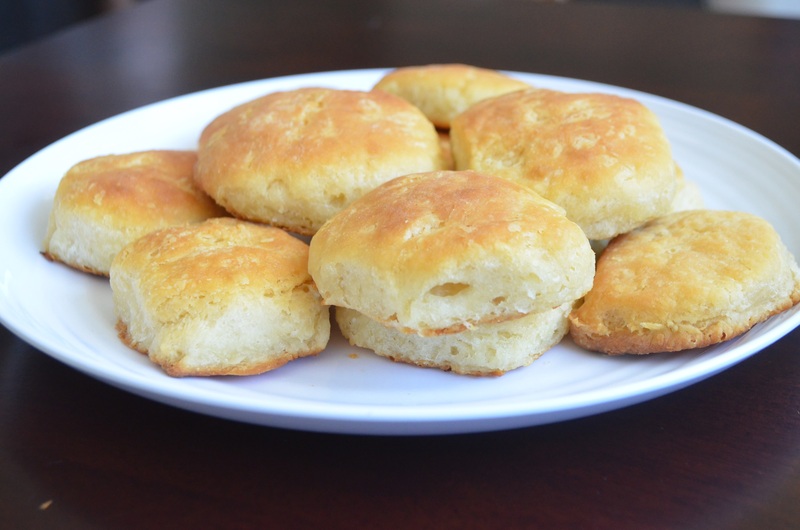 Making an ideal buttermilk biscuit is all about using cold ingredients, if it is warm before getting into the oven the ingredients start to react with each other. Step 3 Add buttermilk to the flour and gently mix together with your hands or use a wooden spoon. Step 4 Sprinkle your working surface (counter top) and rolling pin with self rising flour.Turn your dough to your surface, sprinkle some flour on your dough and gently roll your dough into a rectangular shape and fold, roll again and fold. repeat folding process 4-5 mins making the dough about half an inch thick. Step 5 Preheat oven to 470 degree F. Layer your baking pan with parchment paper and lightly grease or sprinkle with flour. Step 6 Using a biscuit cutter, dip your cutter in flour and cut out in circles. Place on baking sheet, closely together making sure they are touching each other. When they touch together they help each other rise. Step 7 Bake for 12-15 mins until the top is golden brown. Brush with melted butter as soon as it comes out of the oven.